Let these full color coolies paint your image on an already stellar canvas. You will be sure to gain the attention and have the audience looking at your new coolies. Choose from American Flag, Money, Large Grass, Small Grass, Drift Wood, Green Camo, Pink Camo, Palm Trees, Sand, Beach, Pool Water and Miss Liberty herself are all options to choose from. Free artwork available for those who don't know what to print over these already classy coolies. 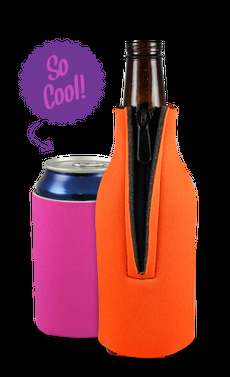 Let our graphic team help you design the perfect koozie that you will be proud to hand out.